When shopping around for the best RV awning cleaner, you should look into several factors, such as performance, price, versatility and safety. That is why we have put up a guide that highlights these things and more when shopping around for an awning cleaner. In today’s guide, we would also like to help you narrow down your choices by reviewing the best products in the category. And to figure out how effective they are, we have reviewed their performance and versatility, to name some, so that you can compare later. If you’re ready, let’s begin with our top picks for RV awning cleaners on the market. The RV awning is one of the best features of a recreational vehicle because it can protect us from the rain and the heat of the sun. It is great in providing us the shelter and is also easy to install. But despite its excellence in performing its functions, it can suffer from wear and tear over time. 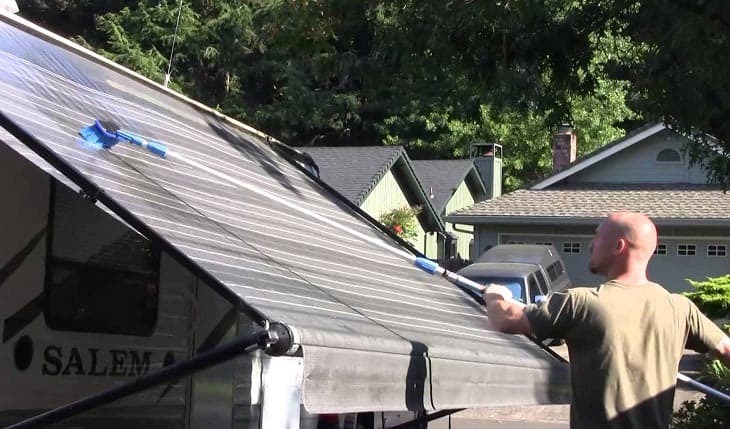 If you don’t take care of it with a travel trailer awning cleaner, it might suffer from the buildup of mold and mildew, grime and other road pollutants. Thanks to the Camco 41024. The Camco Pro-Strength is one of the best in the category because it can help us remove all the dirt and outdoor pollutants, including tree sap, mold stains, road grime and black streaks. It is a professional strength product that saves money because just a little of it is effective in cleaning the awning. This product is ideal for many types of RV awning materials. You can depend on it whether yours is a vinyl, nylon, fabrics and acrylic. It is formulated to work on these materials and more, so you don’t have to worry about damaging the surface. Another thing I love about the Camco 41024 is its versatility to work on pop-up campers and tents as well. So in that case, it can be our perfect ally in camping as well. We can simply clean these items before camping and restore their great appearance. I also love that this product comes in an economical size of 32oz bottle. If you want to bring life back to your awning, you should not overlook its care and maintenance. For this reason, you should choose an effective cleaner that can eliminate grime and road pollutants on the surface of your lovely RV awning. For the best cleaning results, I recommend the Camco 41024. On the not so good part, it might take some time to remove deep-seated stains. Another excellent awning cleaner I found is the B.E.S.T. 52032 because it works effectively in removing all types of buildup on the awning. When shopping around for an awning cleaner, don’t miss this one out because it is an ideal one that can restore the new-like appearance of the recreational vehicle. The B.E.S.T. 52032 is one of the best products in the category to keep the top condition of the awning, which is always exposed to pollutants. If you want to protect this valuable investment from discoloration and deterioration due to harsh weather elements, changing temperatures and outdoor pollutants, you can rely on the product. Cleaning RV awning is easier with the product that does the job right versus others in the same category can. With it, removing grime, dirt, mold and mildew will be quick and easy. It has a professional strength that eliminates these pollutants on the surface of our RV awning, and then conditions it to restore its great appearance. The product is also safe for regular use because it does not contain any hash ingredients that would otherwise discolor or stain the RV. It does not also have any abrasive components that could leave powdery residues on the surface. It also offers ease of use because you just have to spray the surface with it and then hose it off to rinse. There is no scrubbing needed. The cleaner works on many types of materials, including fabrics, vinyl, natural fibers and acrylic. It can protect the awning from deterioration due to salt, weathering and sunrays. On the cons, it is a bit pricey, though. 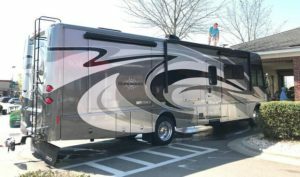 When shopping around for an RV awning cleaner, you must look for one that can also remove black streaks, which ruin the great appearance of the awning. The Korkay cleaner is one of those I found to be doing this excellent job. It is not just ideal for removing dirt, grime and other types of buildups on the surface of the awning, but it is also great in conditioning the awning. With it, you can protect the awning from discoloration and deterioration caused by its frequent exposure to the harsh outdoor elements, including sun’s rays, hail and rain, and other weather conditions. I also love its versatility because it can also work well for different purposes, including cleaning trailers and boats. With that said, you don’t have to buy separate products to clean these vehicles. One thing I also love is its ease of use. 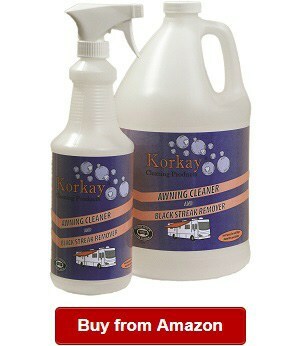 All you have to do is to spray the Korkay Awning Cleaner, and then wipe it off. You don’t have to rinse it off, so you can be sure that you can also clean the awning quickly. In addition, you can save money because it can offer a waterless cleaning. This product is also safe to use on many types of materials, including vinyl, acrylic and natural fabrics. You can also use it to clean the sides of the recreational vehicle. Also, you can use it to get rid of bug deposits, air pollutants, tree sap and other types of road grimes. On the downside, it can take some time to remove heavy buildups. One of the things I love about the 303 Cleaner is its versatility. It is one of the best features that it can offer. Did you know that we could use it to clean our cars, home and patio? This product is a winner in performing many cleaning tasks in the recreational vehicle, too, because we can use it to clean the sides of the vehicle with it. The All Purpose Cleaner is a multi-surface cleaner that works overtime without you having to take so much time in getting the job done. You can be certain that it works on many types of materials without damaging them. It does not contain any substances that would leave any powdery substances on your RV awning’s surface. It can also remove the toughest oil, grease, spots and stains. The product is perfect for everyday cleaning because of its effective cleaning power. It is also safe to use on painted surfaces, decals, couches and more. I also recommend it because it is dye-free and solvent-free, so you can have peace of mind that it won’t cause discoloration and deterioration on the surface. The multi-surface cleaner is also perfect inn cleaning delicate, natural and synthetic fibers. I also love that it can rejuvenate and protect surface. This product also contains no acids or caustics. Overall, it is also a great product that can clean most surfaces. It can also be used at home, patio and cars. On a not so good note, you might have to take more time in removing heavy grime. Mold and mildew can build up and ruin the appearance of your RV awning. This is a common concern among RV owners, but this problem can now be solved using the Star Brite stain remover. It works effectively in cleaning grime, stains and other buildups on the awning. You can also rely on it if you’re looking for an easy to use product. You don’t need to take a lot of time in cleaning because it can remove stains on the surface without needing heavy scrubbing. In addition, you just have to spray it on and then scrub it gently. Then, you just have to rinse off the stains. This product also has a buffered formula that works well on many types of upholstery materials but without harming the stitching and the components. 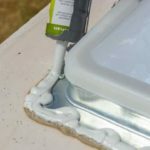 I also love that it can be used on many types of surfaces, including tiles, gutters, vinyl upholstery, plastic and vinyl headliners. It is also made in the USA, so you can have peace of mind that it is a top quality product that delivers and performs well. 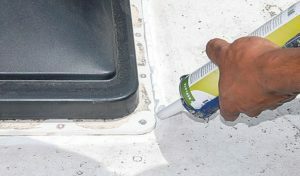 The Star Brite stain remover can get rid of unsightly build up on the RV awning. The product won’t also harm any vinyl threads and vinyl upholstery. It is an ideal stain remover that can also be used on different environments. The stain remover can also be used in marine environments and cleaning tents and boats. You can also use it on pop up campers and other types of vehicles. However, this product is a bit pricey. 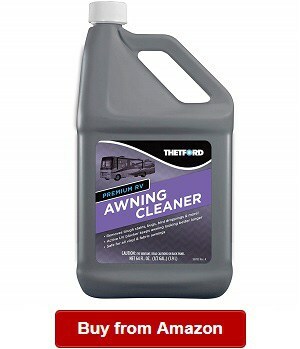 The Thetford 96017 is a versatile and multipurpose cleaner designed for use in RV awning and other surface materials. It does not only clean but also conditions the surface. You can also rely on it for protecting your awning from the harmful UV rays of the sun. With the sun protection it can provide, you can ensure that you can extend the life of your awning and prevent it from discoloration and deterioration. This product is also safe to use for many surfaces because it does not contain any powdery or abrasive substances. It won’t also harm upholstery threads, vinyl, plastic, acrylic and other kinds of RV materials. 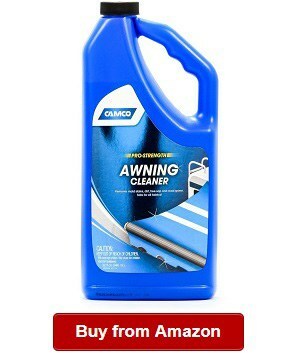 This awning cleaner is also proven non-toxic, so it is safe to use. You will also love that it is non-flammable and biodegradable. It is proven environment-friendly, so it won’t harm the environment. Another thing that makes the Thetford awning cleaner one of the best in the category is that it does its job perfectly, while also being versatile to use on synthetic and natural fabrics. It does not contain any harmful ingredients. This premium cleaner also contains no chlorine, so it won’t stain or discolor any surface. You can also rely on the product for cleaning different surfaces, including awnings, tents, pop up campers and many other items. This premium cleaner is also economical because it is larger than other products in the same category. It comes in a 64-ounce container, which only means you can use it for a couple more uses versus other smaller varieties. On a negative note, this product might require reapplication on heavy stains. 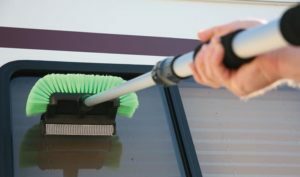 Just as what you can read in many RV awning cleaning tips, you should keep the awning surface clean to extend its life and prevent it from damage. It is available in a 4-ounce concentrate, which can make two quarts of cleaner. It is also a complete kit that already comes with one-quart spray bottle. This product can be used on clear coat, decals, upholstery, vinyl, plastic, acrylic and other surfaces. You don’t have to worry about it damaging the surface because it does not also contain harsh or abrasive substances or components. You can also use it to condition and protect the RV awning. It is one of the things I love about the cleaner, which is also one of the most dependable in the category. Another thing I would like to highlight about it is its powerful cleaning action. 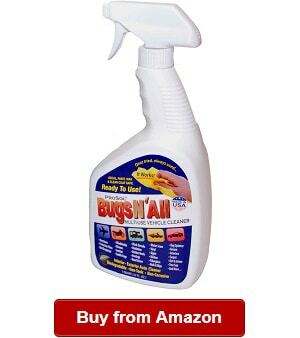 This product can mush bug deposits in only about 60 seconds. It can also release oxidation and black streaks in only 25 seconds. It is also a multipurpose product that has other cleaning purposes, including smoke haze, grease, water scum, smoke, grime, haze, algae, odors, grime, stains and food stains. You can also use it in removing bird droppings, carbon, rust stains, dirt and more. This product also has a 100% risk-free guarantee, so you can return the remaining portion if you’re not satisfied with the results you’d get. I also love that it is a concentrated product and has a professional strength. You will get two quarts of cleaner ready from its variety. This product is also perfect for use on all types of vehicles, including motor bikes, semi truck, RVs, boats, snowmobiles and airplanes. You can also use it on rubber roofs, awnings and fiberglass. On a little issue, its risk-free guarantee could be improved. 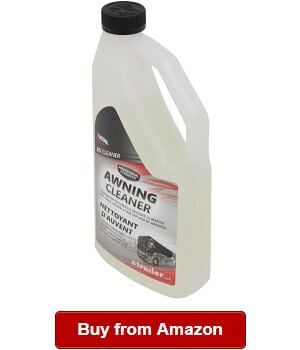 The Wet and Forget RV awning cleaner is a great dependable product for RV owners looking for a versatile cleaner. 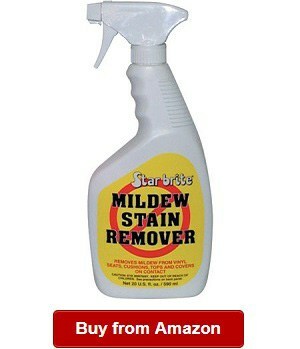 It is an ideal stain remover, which can remove moss, mold and mildew. You can also rely on it for eliminating algae stain. In addition, another thing I love is that this cleaner can also remove scum, bird droppings, carbon, food stains and dirt. It is also ideal for removing different types of stains and road grime. This product is also professional grade that is ultra-concentrated. This variant can make three gallons of cleaner. The Gentle Spray and Leave Cleaner require no rinsing or scrubbing. You can also rely on it for power washing. You can use the Wet and Forget 800003 on any surface because it does not contain acidic components, bleach and phosphates. It won’t leave any water streaks and spots, too. I also recommend it for its effectiveness in keeping the surface clean for at least one year. 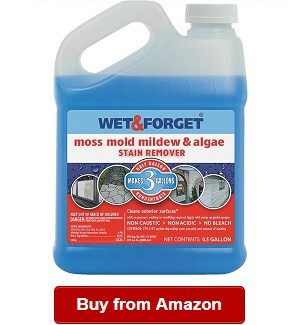 This product is one of the best in the category when it comes to eliminating lichen, moss, mildew, algae and mold. You can also rely on it because it doesn’t require any hard scrubbing, so it can give you the convenience of cleaning without spending much time in the process. You don’t also need to rinse it off, so you can save water. It also doesn’t need pressure washing because it can target the stains and eliminate them effectively. Overall, the RV awning cleaning solution is one of the best in the category. It does not contain bleach and acids. It is also professional grade and safe even when used around plants. On the negative side, it might not be able to remove old stains easily. The awning cleaner is a highly concentrated product that deals with even the toughest stains, including lichen, mold, mildew, moss and algae. This product is also specially designed and created to remove tree sap, scum and road grime. You can also rely on it if you’re looking for a product that can also condition the surface of the awning. 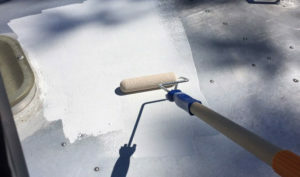 It can also protect the surface from sun’s rays that would otherwise cause fading, discoloration and deterioration. The Valterra LLC V88542 contains no harsh chemicals and color-fading components. I recommend it because it can be used for siding, roofs, decks, RVs, driveways and boats. In addition, this product works well on different materials, including plastics, vinyl, acrylic, natural fibers and synthetic fabric. This cleaner is also for many purposes and applications including for commercial, such as hospitals, freeways, schools, parks and hotels, among others. In short, you can use it virtually on all surfaces. Aside from cleaning the RV awning, it can also condition and protect the surface. It can help in keeping the top condition of the awning, preventing frequent maintenance or repairs. The cleaner can also leave any surface super clean because it can work effectively in cleaning different outdoor pollutants, such as tree sap, bird poop, grease, wood trim and metals. I also recommend this product because it is very easy to apply and can clean quickly. For busy RV owners like us, using a convenient to use and efficient product is one of the best in the category. On the negative side, it is a little bit expensive. If you’re looking for ways in cleaning mold off camper awning, your answer can be the CarGuys Super Cleaner. 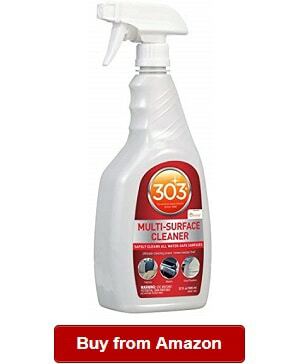 It is one of the best surface cleaners on the market, including on leather and vinyl. You can also use it on rubber and plastic. It is an 18 oz kit that you can conveniently use on your vehicle, tent and pop up camper. This product is a great solution for cleaning RV easily because of its nano-technology. It works by lifting grime and dirt away. 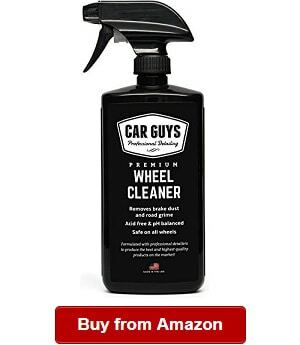 The CarGuys cleaner is a multi-purpose cleaner that saves you energy and time. You can depend on it for its safety because it contains no harmful chemicals. It is an effective RV awning cleaner that can get rid of tar and bug. 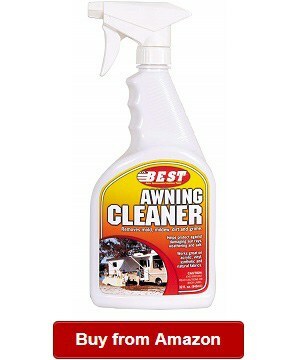 I love this best awning cleaner for RV because it cleans most surfaces, either interior or exterior. You can also use it to clean fabric, upholstery, canvas, leather, plastic, bird poop and rubber. It is the one solution also if you’re looking to clean wood trim and grease. When shopping around for a good RV awning cleaner, you should also look for one that leaves a clean finish without the gloss. It cleans great without leaving any tacky and greasy film. It also has good cleaning agents without leaving any cloudy finish. It is also not just a cleaner but also a conditioner that can protect your awning from damage due to UV rays and rain. So if you’re looking for ways on cleaning the RV awning, you can rely on this product to make the entire process simple. And if you’re not happy with the purchase, you can also get a full refund. That’s another thing I appreciate about this product. On the negative side, it is not for panel screens. 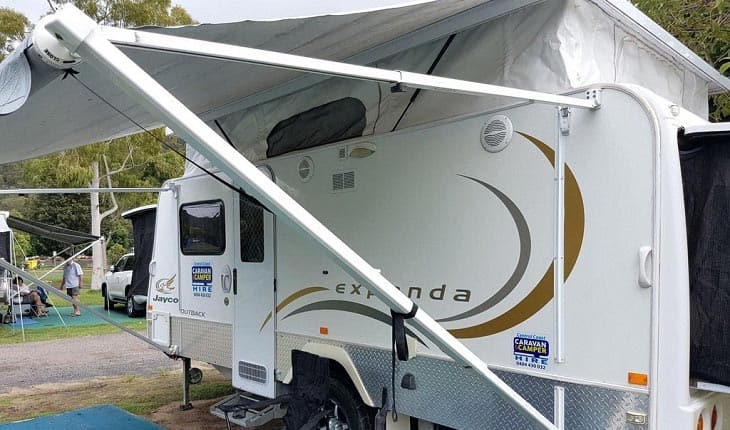 You should trust us when looking for the right recreational vehicle awning cleaner because we’ve carefully selected only the best products that can effectively clean and condition the awning. We have also considered several factors in choosing this awning cleaner. A few of them include performance, versatility and convenience. These and more are important when shopping around for this product, as they can ensure you’re using a safe and versatile product that cleans the awning without you spending too much time to complete the task. 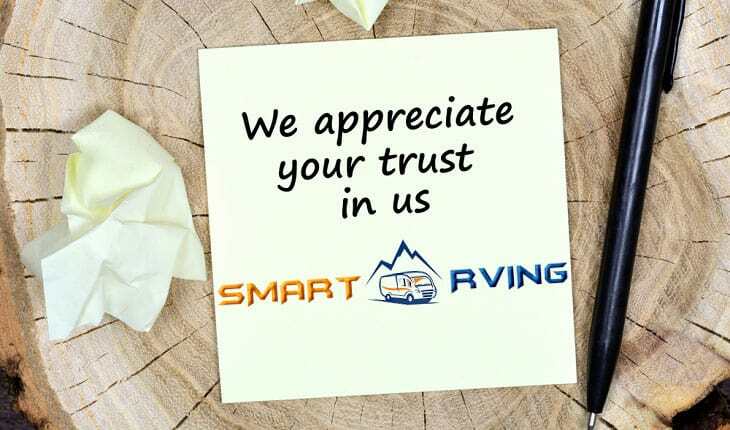 Our team is also composed of real RVers that have vast knowledge and years of experience in RV camping and caravanning. We have firsthand experience in using awning cleaners and conditioners. That’s why you can trust us when it comes to providing you with reliable information when looking for awning cleaners. The RV awning cleaner is a special recreational vehicle product that is used in cleaning the awning. It can remove dirt, scum, grime, road film, dust, bird droppings, tree sap, black streaks and other pollutants that ruin the surface of the awning. This product is also used in conditioning and protecting the awning from the elements, including the sun’s rays and the rain for the protective coating that some of the best products can leave. The vinyl awning cleaner can also be used on other materials, including synthetic fabric, natural fibers, leather, vinyl, plastic, acrylic and so many more. It can also be used on upholstery, couches, cars, patio, home and vehicles, including snowmobiles, campers and recreational vehicles, and so many more, depending on the brand and model. This product is also easy to use because many of them only require spraying and then wiping off. Some of them also require no rinsing. The best among the leather, plastic or acrylic awning cleaner is also safe and non-toxic. Many are also made of biodegradable and environment-friendly ingredients. An RV awning cleaner, such as a Beast Wash cleaner, is also a great remover of mold, moss, lichen, algae and mildew. It is also perfect for removing deep stains and black streaks. Without even saying, the cleaner does not only clean mold off RV awning but also serves as a multipurpose cleaner that removes most types of outdoor pollutants. There are not many types of RV awning cleaners because many of them are composed of the same main ingredients. They also contain no chlorine and harsh chemicals. They can clean and condition the surface of the awning, and then protect it from the sun, hail and rain. 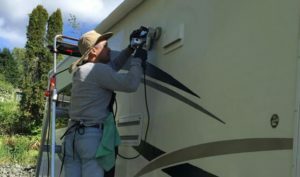 These cleaners can keep the top condition of the RV awning. They can also be used in conditioning the surface of upholstery and couches. This type is very easy to use because it is in a spray bottle. You can just spray it on the surface and then wipe it. Convenient and handy, the RV awning cleaner is also very efficient one because only a small amount of it can remove deep-seated stains, including mold and mildew. It can also eliminate grime, road film and tree sap, and many more. This concentrated recreational vehicle awning cleaner is also a choice among RV owner because it is professional grade. Just a specific amount can make quarts of awning cleaner. It is a special treatment product that also conditions and protects the awning, which is always exposed to the sun’s harmful UV rays, rain and other weather elements and changing temperatures. The concentrated cleaner is also very economical and practical for many uses. It can be ideal for those RV owners that need periodic applications. Using the RV awning cleaner, you can experience convenience and comfort because it is easy to use. Some of them are also just a spray on formula that you can easily mist on the surface and then wipe it off without rinsing it off. That is one of the things you will appreciate with this cleaning product. With the convenience of use it offers, you don’t need to spend so much time in cleaning the RV awning. Some of them can also maintain the cleanliness of your RV awning for at least one year. It is also an economical product that is ultra concentrated. Just a small amount of it can make quarts of cleaners. With that said, you can also save money in the end because you don’t have to buy it very often. It is an economical cleaner that you can use for periodic applications. But if you’re looking to use it more frequently, you can opt for the bigger varieties, such as 64 ounces ones. This product does not cause discoloration and fading. It won’t harm the color of your upholstery or awning fabric. It can clean, but it does not have bleach in the composition. With it, you can have peace of mind that it can protect the color of the surface. The awning cleaner also contains no abrasive materials that will leave chalky or powdery residue on the surface. Without harsh chemicals, the product can effectively clean without damaging or ruining the appearance of the surface. 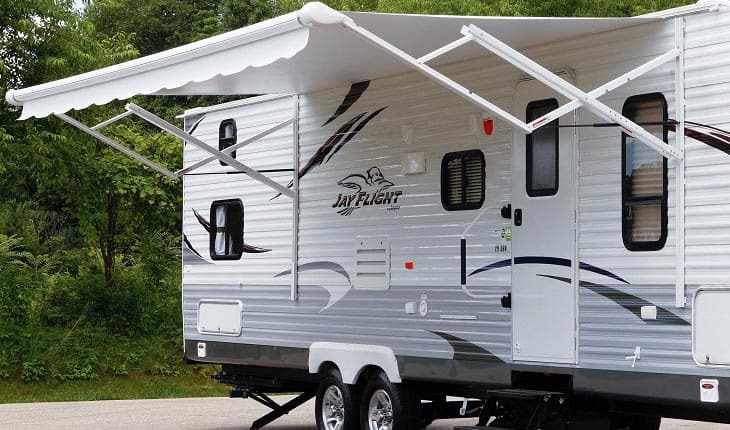 The RV awning is always exposed to the harsh weather elements and changing temperatures. With the awning protectant, you can rest assured that your awning will stay on top condition, reducing the need for frequent maintenance. It can condition the surface and protect it from the harmful UV rays of the sun and rain. It can reduce the maintenance needed. Some of the best products can keep the awning clean for at least one year. With that said, you don’t also have to do frequent cleaning on the awning, upholstery and car. It can also reduce maintenance on marine and boats. You can also use it on tents and pop up campers. A few concerns for RV owners include mold, mildew, moss, lichen and algae. In addition are black streaks, grime, road film, dust, bird droppings, bug deposits and tree sap. These problems can be eliminated using an effective cleaner that works overtime to keep the lovely appearance of the awning. This product can be used for patios, cars, homes and many other applications. Some of them can also be for commercial uses in hospitals, hotels and motels, depending on the composition and product you’re buying and using. It contains no harsh chemicals but only biodegradable components. You don’t only clean, condition and protect the RV awning but also save the environment because it contains biodegradable components. 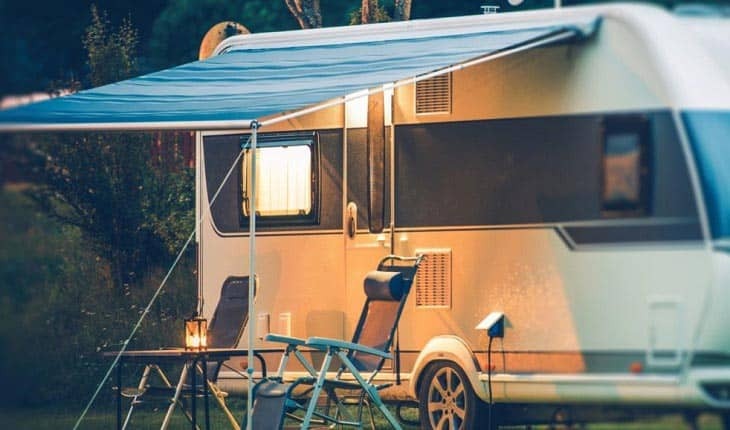 There are some factors to consider when choosing an RV awning cleaner because not all of them may be effective in removing heavy stains, mold, mildew, black streaks, algae, lichen and tree sap. So in this review, we’ve carefully chosen, compared and reviewed those products that work effectively. Check out the following for a few considerations we’ve looked into in today’s top picks. We’ve chosen products that are versatile and multi-surface effective. The products we’ve reviewed are those to use on different types of surfaces, including natural and synthetic fabric, vinyl, gel coating, finished leather, plastic and other materials. One of the strongest features of a good awning cleaner is ease of use. It must not give you a hard time in removing deep-seated stains, black streaks, mold, grime, mildew, moss, algae and lichen, among other pollutants. The best products are professional grade, so just a little amount of them can eliminate these issues and buildups. When it comes to performance, you must consider one that has an excellent cleaning, conditioning and protecting power. It must also be able to provide long-lasting clean finish but without grease. It should also work well on the surface and remove the issues without you having to exert so much effort. Some of them are just sprayed and then wiped off to r remove mold and mildew stain. The products we’ve featured and reviewed today are coming from different price ranges so that you can easily narrow your choices when picking the right product at a price you can afford. When reviewing RV products, our team is also considering their composition. It is important to avoid ruining or fading the surface. In comparing awning cleaners, you must find one without chlorine, abrasive components and acids. It must also be safe on colors and most surfaces. The composition should not also cause deterioration of the surface or the damage of the stitching. We have also selected top brands in the category so that you can be certain that the products are from companies committed to their quality and effectiveness. It should be non-toxic, safe around pets and plants and made of biodegradable ingredients. So if you’re looking for the best way to clean RV awning with an effective product, you must also look into the safety of the product you’re buying. A: How do you clean an RV awning? Q: If you’re looking for ways on how to clean underside of camper awning, you can simply use an awning cleaner. You can just spray it on the surface, and when done, wipe it off. Many of the best formulas also require no rinsing and no special tools. A: How to clean vinyl awning on RV? Q: If you want to learn how to clean a camper awning or any other material for the awning, you can just use a specially designed and made cleaner that is suitable for the kind of material your awning is made of for the best results. 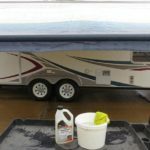 A: How to clean white RV awning? Q: A white awning is easy to clean and condition using an effective cleaner that is suitable for the type of material it has. Just spray it on the surface and then use a hand pad to wipe it off the surface. You don’t need to rinse it off in the case of some awning cleaners. A: How to prevent mildew on RV awning? Q: This issue can be hard to prevent even with cleaning RV awning bleach especially the awning is always exposed to the outdoor elements and changing temperatures. You can prevent it from building up by taking care and cleaning the awning with an RV cleaner that can keep the long lasting clean finish of the awning. It can also protect the awning from the future buildup of not only mildew but also moss, algae and lichen. When selecting an awning cleaner, you should check its performance, composition, versatility, convenience of use and price, among other factors. 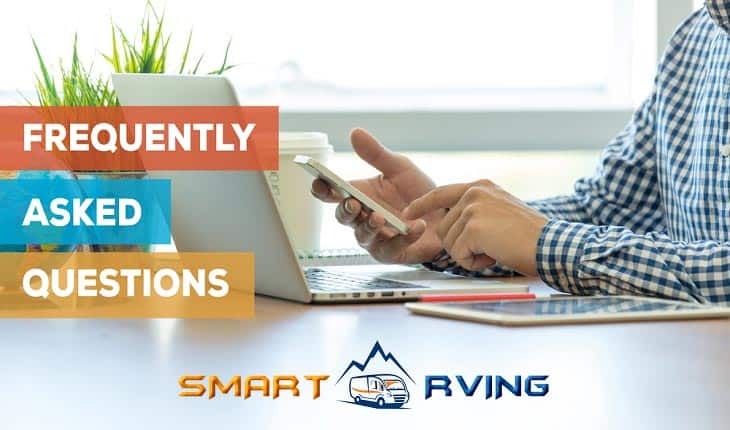 We do hope that you can choose the best RV awning cleaner based on the things to look for as well as on the best products above that you can select from, buy and use for your recreational vehicle. If you’re looking for more products in RV cleaning and maintenance, then I suggest going for these articles: best RV roof coatings, best RV roof sealants, best RV caulks, best RV wax, best RV roof cleaners and best RV wash and wax. I do hope you will like them. Happy shopping!